As we get closer to the marathon, the perks begin to appear: training runs in cooler weather; running sneakers that are comfortably broken in; and an escalating confidence in athletic ability. For me, the idea of running 26.2 miles starts to become palpable in mid-September (a realization that I have to keep up with a Marine is also incentive to stick to my training schedule). For Jeremy Boutwell, my marathon teammate, his long training runs are becoming more comfortable as he continues to train in the Texas heat. Another perk of getting closer to the race is the increased buzz and encouragement on social media websites like Facebook and Twitter. There’s a large running community that tends to get more communicative in September and October. I eagerly await Facebook status updates on my newsfeed from Marine Corps Marathon organizers. “Happy September runners! That means the Marine Corps Marathon is NEXT month! !” and “It’s. Getting. So. Real.” are two of my recent favorites. On Tuesday, a photograph posted to the Marine Corps Marathon Facebook page appeared on my newsfeed and forced me to pause during a busy workday. The photograph shows runners participating in the 26th annual race. 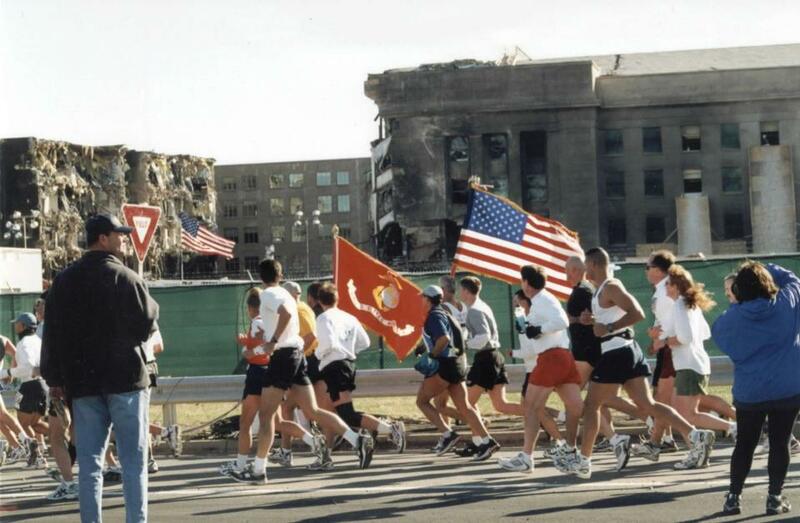 Just two months after the 9/11 terrorist attacks, the runners glide by the heavily damaged Pentagon, American and Marine Corps flags fluttering in the background. The race coordinators continued to plan for the event that year, knowing that many runners might drop out because of security concerns. Approximately 15,000 people participated in the marathon that year. Shortly after the photograph was posted to Facebook, Boutwell and I spoke to find out if we each saw the image. This year, we’re both running the marathon as members of Team “Doc” Almazan, one of the Tragedy Assistance Program for Survivors Run and Remember Teams. While I never met Army Sgt. 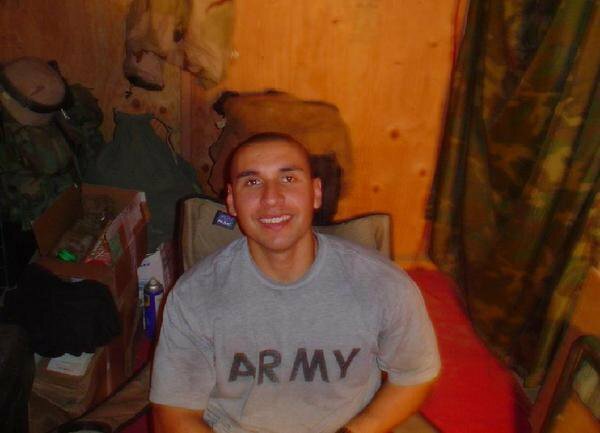 David Almazan, a combat medic killed in Iraq in 2006, I’ve run several races in memory of him and in support of his wife, Salina Jimenez, whom I met during the 2010 Marine Corps Marathon. Almazan’s humvee was hit by an IED three weeks into his deployment. A proud Mexican native, he was working at Costco on Sept. 11 when the world changed. He joined the Army one year later. “Part of his reason for going [into the Army]was [to have]the camaraderie in a country he was not born in but called his home,” said Jimenez. In addition to running for Almazan, Boutwell is also running in memory of several friends he lost during his deployments to Iraq, including Pfc. Ricky Morris, Pfc. Brandon Smith and Lance Cpl. Nicholas Perez, members of 3rd Battalion 7th Marines. Perez and Smith were killed within a week of when Boutwell was wounded by an IED in 2004. On Sunday, Boutwell and I will participate in the Inaugural Navy-Air Force Half Marathon in Washington, D.C., as part of our training. I’ll be wearing my TAPS singlet with Almazan’s photograph on the back. Boutwell plans to use the course as a test run for pacing. He also told me he’ll be thinking about Morris, Smith and Perez during the race. Deputy News Editor Bethany Crudele plans to run in October’s Marine Corps Marathon with retired Staff Sgt. Jeremy Boutwell. She is blogging weekly about his preparations for the race — and hers — on Battle Rattle.